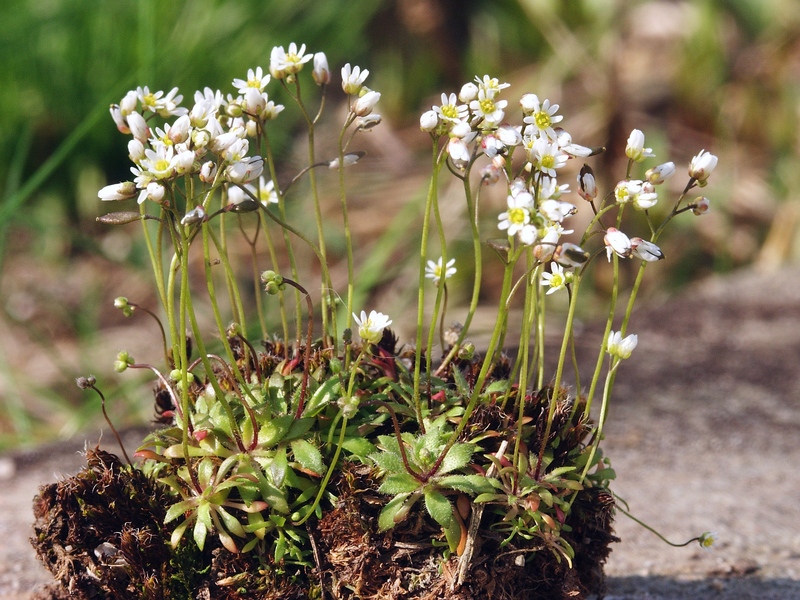 Draba verna is an annual or winter annual herb, very small, from a taproot (Yatskievych 2006); flowering stems very slender, 5-20 cm tall. Leaves all in a crowded basal rosette, 1-2 cm long, 0.3-0.4 cm wide, widest above middle, surface hairy, hairs forked and often from a wart-like base. Flowers white, 0.2-0.3 cm wide, 4 petals split to middle, base narrow, sepals 4, hairy, stamens 6, short, ovary superior, stigma broad, no style; inflorescence branched, floral stalks to 0.3 cm in flower, elongating in fruit; blooms March-May. Fruit a dry pod 0.4-1.0 cm long, 0.2-0.4 cm wide, flattened side to side; seeds 40-60. Origin: Eurasia, widely naturalized in N. America. Habitat: Lawns, open disturbed places.